Self-published authors choose their own Book Pricing, except for print, where a minimum price is required by CreateSpace. Some authors base their prices only on the length of the books. Others price according to similar length books at the retailers. Many set prices by the royalty rate. Whatever the method, over- and under-pricing books can have an adverse effect on sales. Yes, authors should value their work. However, setting a book’s price higher than the average cost of similar works can mean lost sales, especially for new authors. Readers (buyers) are unlikely to take a chance on someone they have no experience with if the price is above what they normally pay for their auto-buy authors’ books. The days of the free and ninety-nine-cent one-click are fading. Readers (buyers) have come to realize that many self-published books priced below average are often lacking in good writing craft and editing. A well-written and well-edited book is worth more. This strategy doesn’t include temporary sale prices and first-book-in-a series perma-free/perma-sale. When an author has published several books in a series, she may choose to make the first book free or a lower price than the rest to gain additional readers. She typically has an established following and can rely on reviews and word of mouth to attract new readers. The lower price is an enticement to buy more books in the series. So, how does a new author know what price to charge for her book? Research the formats. Find comparable length and genre books on retail platforms. If the most common current selling price for a 90K self-published paranormal in e-book format is $4.99, that’s usually a good indication of an effective price point. Be sure to set the same e-book price for all retail outlets. Compare trade paperback prices that are same word count and genre to set the print price. CreateSpace computes a minimum selling price for all print books on their platform, which translates to the minimum selling price on Amazon. Currently, $13.99 to $16.99 is the average price range for 80K to 100K trade paperbacks, but genre does influence the price, so be sure to research. For multi-published authors with a loyal readership, a lower-priced or free first book (permanent or temporary) can be an effective marketing tool. A lower-priced or free book with no others in the series available means the author often gains nothing from the pricing strategy. The reader may love the first book, but she has no second book to buy. With today’s immediate gratification attitude, the reader may or may not be patient enough to wait for the next release. Timing and patience are very important. Pricing for boxed sets should be set lower than the total cost of buying each book separately. The boxed set concept is based on the buyer getting a better price by buying more than one book at a time. Example: Each book in a three-book series costs $3.99. The total cost to buy them separately is $11.97. The boxed set price can be set from $1.00 to several dollars less than the separate-purchase price. A price of $9.99 is likely to achieve more sales than $11.97 to buy each book. Do a little research before setting a selling price. The more a book fits the market, the better the chance for success. Check off #10! The to-do list is getting shorter! 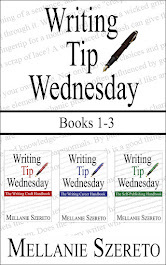 Be sure to check out the writing craft series, Writing Tip Wednesday: The Writing Craft Handbook, in e-book at Amazon, B&N, ARe/OmniLit, iBooks, and Kobo, and in print at Amazon and CreateSpace, and the writing career series, Writing Tip Wednesday: The Writing Career Handbook, in e-book at Amazon, B&N, ARe/OmniLit, iBooks, and Kobo, and in print at Amazon and CreateSpace. Your information is so helpful.